When new people came to visit, I’d give them a quick tour of the house so that they’d know where to find things. It didn’t matter where I lived–the tiny, fairy tale brick house that was the first to carry my name on a deed, the sprawling ranch hybrid that was intended to be the cornerstone of my growing family, or the two-story colonial that marked a new direction–the tour narrative always followed an eerily similar script. At some point, I realized that the tours I gave were for some house other than the one right in front of me. I had a vision for how I wanted it to look and gave the tour based on walls unseen, rooms remodeled, and accoutrements unpurchased. The trouble was, I (almost) never took a step toward making that vision a reality. I’ve left two houses virtually unchanged from the day I moved into them, discarding my dreams for the next occupant to consider. I never made them into what I wanted them to be. I’ve occupied my current abode for almost five years. For the first three of those years, I conducted tours in much the same way. My only saving grace was that I had bought this house much closer to my idea of “finished” than the first two had been. Even so, I’ve slowly come to realize that it doesn’t make sense to live in Someday or Could Be. I need to live in Now, and if Now doesn’t live up to my expectations, I need to change it. And that goes for my house, too. 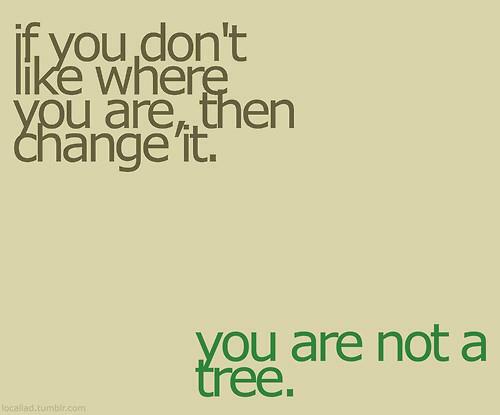 Thanks, Gen Y Girl, for reminding me that I’m not a tree.